Uncontested divorces are most people’s dream scenario. What I mean by an uncontested case is where you and your ex both agree on all the details of your case. If you can get to this agreement, then all you need a lawyer for is to handle creating all the legal documents, and navigating the court system to get a judge to sign off on your final court order. This may seem overwhelming, but here are a few pointers to try and make an uncontested divorce work for your case. First step is understanding what details you need to be on the same page with. There are 5 topics that you and your spouse need to agree on, with details, in order to have an uncontested case. Let me walk you through all 5 here. 1. Spousal Support. 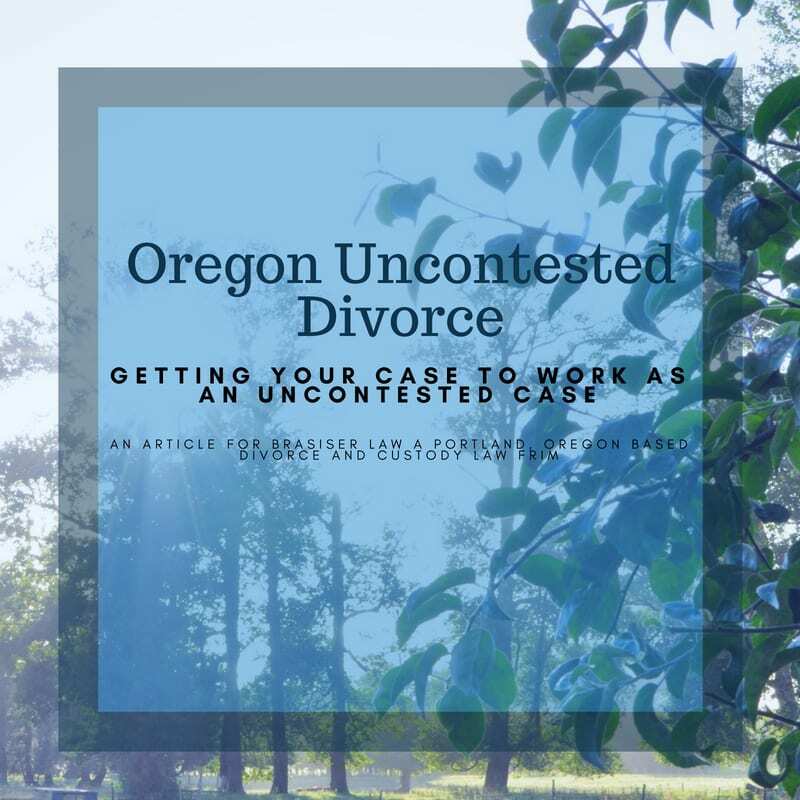 The first thing you need to agree on to make an Oregon uncontested divorce work for your case is spousal support. This is where one spouse is going to pay a monthly support payment to the other. If you and your spouse have similar incomes, or if the marriage is a very short one, spousal support may not even apply to you. Similarly, if you are unmarried, and just have a custody case, then you won’t need to worry about this. If the two of you agree that spousal support is appropriate, then you just need to agree on how much is to be paid each month, and how many months those payments will last for. Those are the only two details you need here: (1) How much each month; and (2) for how many months. 2. Division of Assets. Agreeing on division of assets so that your case will work as an uncontested divorce. Oregon is a 50/50 state. That means that you and your spouse need to reach an agreement about how to fairly divide your things. For instance, if you want to keep the house, then you will have to arrange for a plan to remove the other person’s name from the property, and also for how you are going to pay your spouse his half of the equity in the home. Maybe you can offer to give him some money from your retirement to offset the house value, or you can refinance the house to buy him out of it. Whatever your situation demands, you will need to work out a detailed agreement on who keeps each item of value. In Oregon, custody refers to the legal authority to make decisions for your children. You two will need to agree on which parent will be awarded this power. If you want, you can agree to share this authority. All court orders involving children need to have a detailed parenting plan. This is a calendar showing what schedule the children will use to visit each parent. Often this takes the form of an every other weekend division, but it can be anything the two of you think is best for your children. This is the easiest of all 5 issues. The State of Oregon puts out a child support website where they will calculate your child support obligation. The following is a link to that website so you can run some estimates on what amount is correct. If you and your spouse have looked at this list of 5 categories, and are both seeing eye to eye on everything, then you’re all set. If on the other hand, you feel like you’re pretty close but you aren’t sure about some of the details, then there are a few options available to help you get to an uncontested case. You can try mediation. Hiring a mediator can help you two resolve any sticking points. Mediation usually only works if both people are motivated to be flexible and reach a compromise. Having each of you call an attorney to get a consultation can be helpful as well. Often sticking points are a result of somebody having unrealistic expectations about what they can expect. By calling and speaking with an attorney, you can figure out if what you are asking for is actually reasonable under the circumstances. Unfortunately, if you and your significant other are just not on the same page, then you may need to treat your case as a contested one. We offer uncontested cases at one low price and are happy to set up a free consultation to talk more about how the process works. After reading this if it seems your case will not be able to be uncontested we are still happy to meet with you to talk about how your individual case may look and how you may be able to make it as amicable as possible. Tom Brasier is an experienced family law attorney specializing in divorce, custody, and restraining orders. 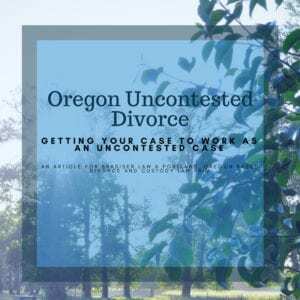 Tom takes uncontested divorce cases throughout Oregon and Washington State. Brasier Law is a family law firm serving the greater Portland, Oregon area and SW Washington. You can reach Tom at Brasier Law by calling 1 (503) 855-4777 or by using the contact form below.